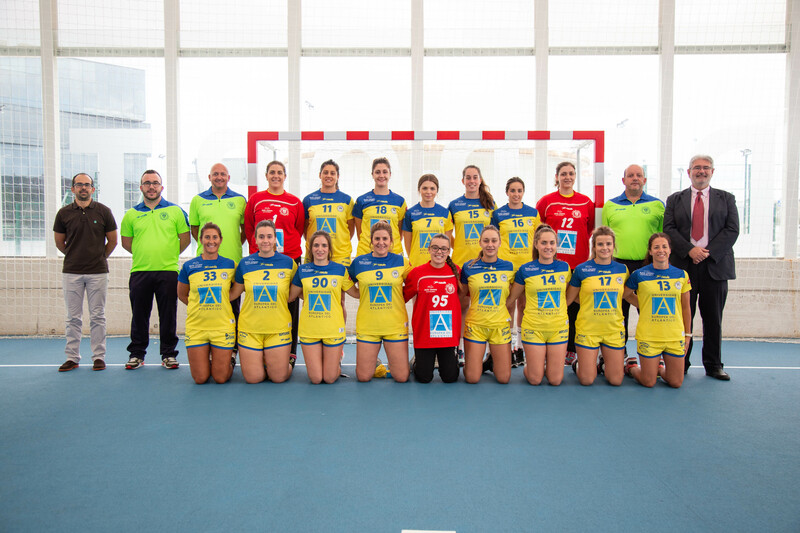 The European University of the Atlantic maintain its support to the sportswomen of the Silver Honor Division of the Club Balonmano Pereda. This relationship started in 2015 with the signature of a first collaboration agreement between the sports entity and the academic institution, and since then, they work together with the aim of promoting women’s sport and the physical exercise among the youngest. Some players and part of the technical team visited yesterday afternoon the UNEATLANTICO campus together with the general secretary of the academic institution, Roberto Ruiz, and the responsible of the technical secretariat, Jesús Peña. In addition to getting to know the facilities, these sports women posed for the traditional family photo that every year marks the start of the season. As until now, the Silver Honor Division will still be called UNEATLANTICO Pereda and the players of all categories will have in their t-shirts the University image. As indicated by the general secretary of the European University of the Atlantic, Roberto Ruiz, “we are proud of collaborating with a non-profit club which counts with around 300 athletes divided into 21 teams”. “This season in which our Club celebrates its 25th anniversary, we can only be thankful to our players because of the enthusiasm they put in every game and the sportiness and team work they show to the supporters”, he added. In addition, the president of the club, Valentín Pastor, wanted to stress “the sensitivity that UNEATLANTICO has always showed towards women’s sports practice that is so in need of support” Also, he added that one of the main difficulties with which the Club has to go through in order to achieve the objective at a medium term, which is the promotion to Honor Division, is “to reach the sufficient funding to make the project viable and sustainable”. The Club Balonmano Pereda counts this 2018-2019 season with 300 children and young athletes under the sporting responsibility of 30 technicians and the coordination of a management board that, as Pastor explained, “keeps the enthusiasm, the responsibility and commitment“. Now, it is time to go back to trainings, games and to the day-to-day of a Club that will for sure continue giving us great moments and many wins.